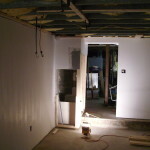 AN INTERESTING BASEMENT REMODEL: There are lots of pictures so page may take a little time to load. This basement project had some features that made it a fun one to do. The homeowner added an addition which included a full basement to an old farm house using steel floor joist. 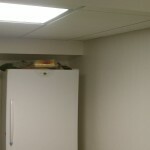 A dumbwaiter that went from the basement to the second floor was installed. 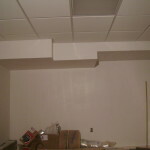 The steel joist meant all the walls, soffit work and supports for the drop ceiling had to be drilled and bolted. 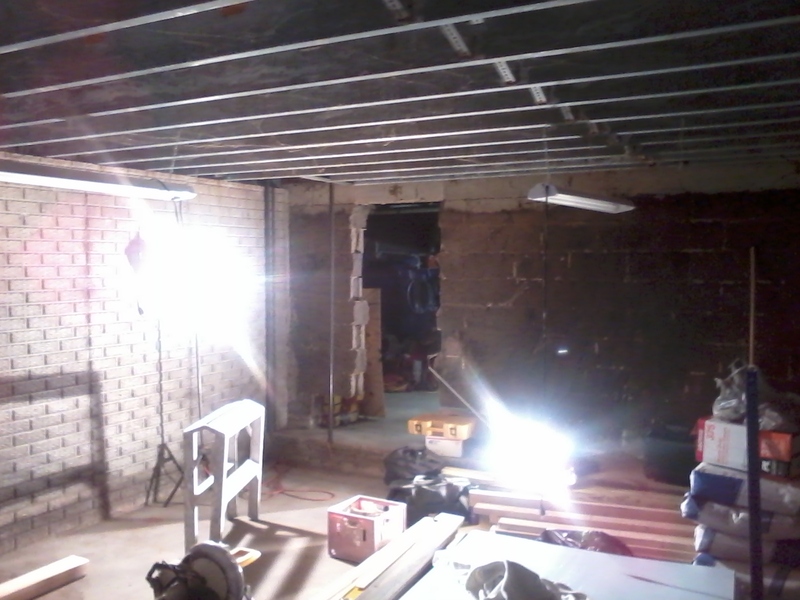 The picture above is looking at the entrance to the original basement from the new one and the upper left is looking into the new basement area. 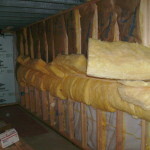 The first step was to install foam insulation panels more for moisture control then for its insulation properties. Because of the faux brick pattern used in the foundation bracing was required to ensure good adhesive contact between the foam and uneven surface of the foundation. To the left is where portions of the old foundation needs to be opened for installing duct work to heat the upstairs addition and this portion of basement. To the right you can see the same area with some of the duct work installed. Three more duct runs still need to be put in place. 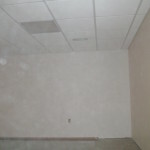 Great care was taken to ensure all duct cracks were sealed with metal tape and all ducts above the drop ceiling were insulated by wrapping foil faced duct work insulation to prevent condensation from developing and dripping onto drop ceiling. 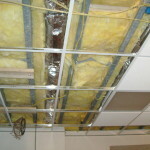 Insulation of the ceiling was done to help reduce noise between the two levels. 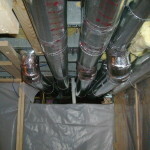 The duct work soffit was over stuffed to prevent dead air space condensation. This careful attention to insulation details ensures maximum efficiency of the central air system. 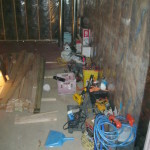 Below are the walls as they are being constructed. 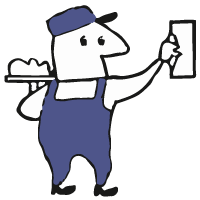 Everything possible was done to prevent the high humidity levels found in basements from creating condensation issues behind the walls and possible mold formation. 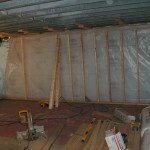 The foundation was foamed, a layer of plastic put over that, the walls were framed and wired. After insulating the excess plastic from the first layer was wrapped up and down the walls and another layer of plastic put over the studded wall thus completely encapsulating the wall. 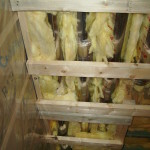 Even the recessed areas where the steel joist sit on the foundation where foamed wrapped in plastic and insulted. 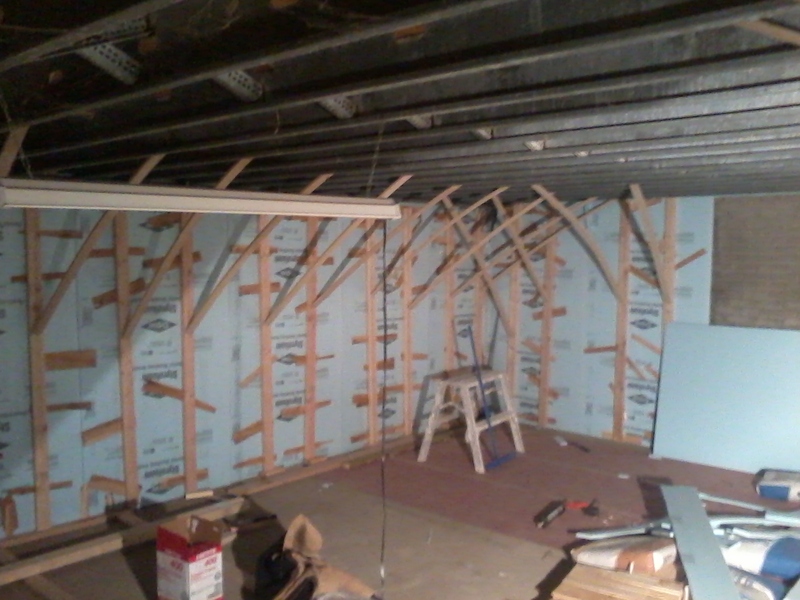 Finally installation of blue blueboard and plaster along with the drop ceiling finished our work in the new section of the basement. 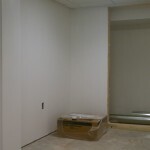 The client had chosen to have a family member install the trim, carpet and access to the dumb waiter. 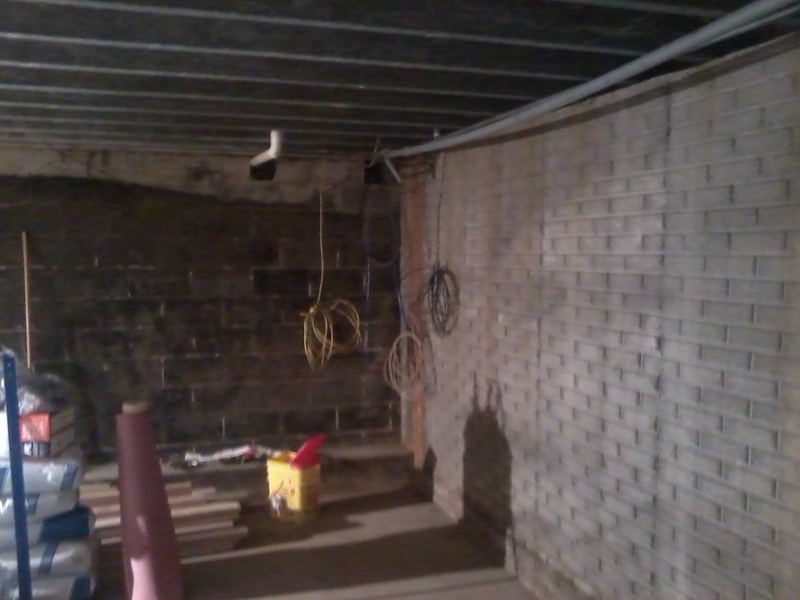 It was time to start on the original basement area. 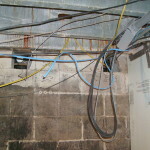 The last set of pictures show the original basement after we were finished with our portion of the work, which of course involved moving water lines, central vacuum system and venting the dryer to the outside. Venting the dryer was a challenge because the sill plate to the original farm house were made of railroad ties. Once completed the original basement contained a big L shaped living area and a laundry room with enough space for a counter and refrigerator. 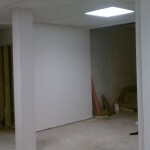 On the left is the entry into the new basement area. The opening in the center is where the stairs are and directly to the right and unseen is the entry into the laundry room. If you turned 90 degrees to the right from where the first picture was taken you will see a portion of the rest of the living area. A peak into the laundry room. The washer and dryer go on the unseen wall to the left which also has a door leading to where the hot water heater and filter system are located under the stairs and front entry way of the house.